(1830-1909) Graduated #4 in the West Point class of 1846. Was Colonel 3rd Maine Infantry, June 1861. He saw action at 1st Bull Run, Yorktown and Fair Oaks where he received two serious wounds resulting in the amputation of his right arm, and was awarded the Congressional Medal of Honor. He also fought at Antietam, Fredericksburg, Chancellorsville, Gettysburg, where he was voted the Thanks of Congress, and in the Atlanta campaign. He founded Howard University for negroes in Washington and served as it's president from 1869-74. Continuing in the Regular Army after the Civil War, he was peace commissioner to the Apaches, participated in Indian fighting and served as superintendent of the U.S. Military Academy at West Point. 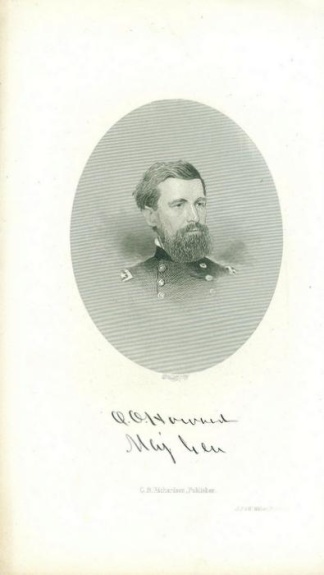 Authentic, antique portrait engraving, in uniform with rank of major general, with printed facsimile autograph with rank beneath his likeness. Published by C.B. Richardson, J.J. & W. Wilson, Printers. 5 1/4 x 9 1/4.